For modern collectors of arms and armour, understanding historical weaponry is a key to appreciating their modern counterparts. Books are important and essential sources of information. But to fully appreciate antique weapons, it is important to be able to see these items in person since even good quality photographs tell only part of the story. 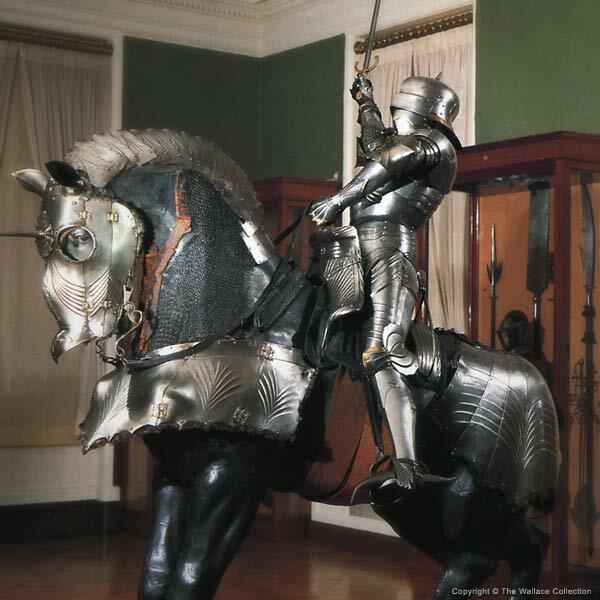 Many museums are accessible to residents of the United States and Europe, and many have items of great interest to arms and armour enthusiasts as well as to family members and friends who don't necessarily share our level of enthusiasm for steel and iron. The Wallace Collection, one of Europe's many fine museums, was founded by the Marquesses of Hertford (most significantly by the Fourth Marquess) and acquired its current name from the illegitimate son of the fourth Marquess of Hertford, Sir Richard Wallace. Upon his death in 1890, Sir Richard bequeathed the collection begun by his forebears to his wife, who in turn bequeathed it to the nation at the time of her death in 1897. The final bequest had the condition that no pieces be added to, or subtracted from, the collection, leaving it basically unchanged for over a century. The collection resides in the ancestral home of the family, the Hertford House. 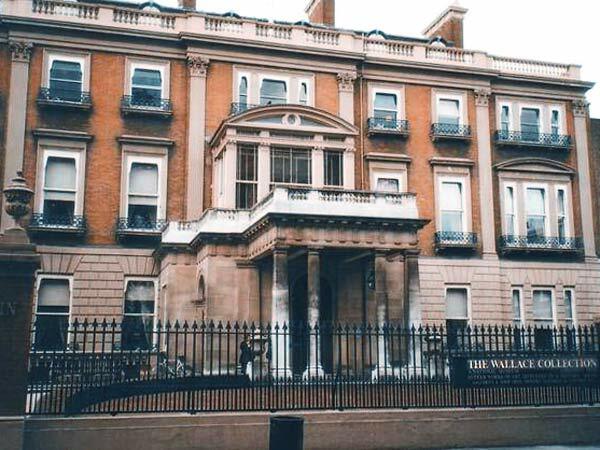 I was privileged to be able to spend a little time at The Wallace Collection during a recent trip to Great Britain. Situated on a quiet turnabout in Manchester Square, it's just a few blocks from London's popular Bond Street shopping district (keep this in mind if trying to convince others to make the trip). The Wallace Collection is of particular interest to the modern students of historical weaponry due to the relatively high volume of good quality, well-documented, significant pieces of arms and armour. It's been on my must-see list for many years. It should not be forgotten, though, that the collection has much more to offer than just arms and armour. Many beautiful paintings and other works of art are also found within the walls of the Hertford house, which is beautiful enough in itself to bear mention and require examination of its architectural style and lavish decoration. The Collection is open daily from 10:00 am to 5:00 pm. Admission is free, though small donations are requested to help the Collection to continue to thrive. At the time this article was written, photography was strictly prohibited at the museum. Photography is now allowed with a free badge available at the security desk. As with photography in any museum setting, please keep in mind that the camera's flash can be damaging to the artifacts and may in fact be prohibited; always check first. Also, please be respectful of the staff and other patrons so any photography doesn't ruin someone else's visit. As nice as the rest of the collection is, I must admit that I spent far less time admiring the paintings, sculptures and other works of art than I did exploring the four galleries dedicated to arms and armour. The first gallery that most visitors come to, the Oriental Armoury, is filled with non-European arms and armour. I saw many exquisite examples of Middle Eastern and far Eastern daggers and knives, interspersed with pieces of armour, in this room. I would have loved to spend more time in it. I was drawn like a moth to the flame, to the next room, filled floor to ceiling with display cases full of arms and armour. Here was my heaven. I went from one display case to another, viewing items I'd only read about in books. As with all the galleries in The Wallace Collection, the display cases in what is known as European Armoury I were well-lit and laid out so you could easily view the pieces, often from multiple angles. Consisting mainly of pieces from the High Middle Ages (apart from a Viking sword and swords/sabers from the early Renaissance), I spent most of my time in this gallery. The arms and armour collection consists mainly of pieces in relatively good condition, though there are a handful of heavily corroded pieces. There are two large cases, mainly of swords, against one wall. In the center of the room are additional cases containing more swords, as well as knives, daggers, impact weapons, and armour (plate and mail). The next European Armoury gallery (number II) covers the Renaissance more fully. 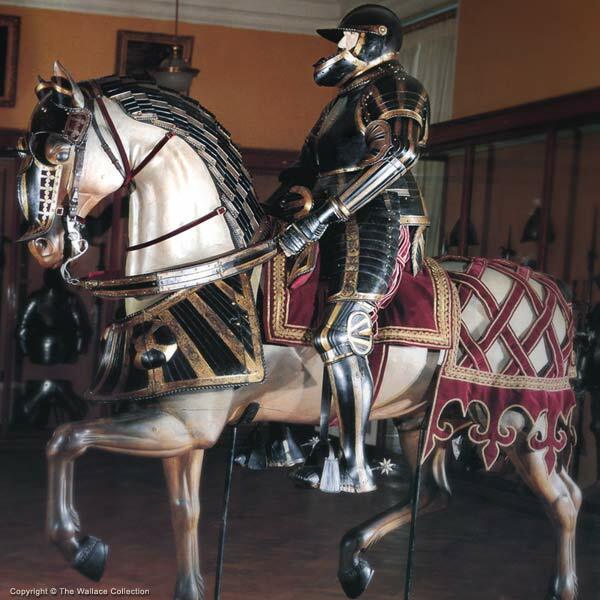 In its center are imposing equestrian statues, bedecked in full harnesses, including a spectacular composite 15th century German gothic armour. Contained in this room, also, are many fine rapiers and examples of ornate parade armours, along with many polearms. The final gallery, dubbed simply European Armoury III, contains a high number of high-quality firearms (including a great number of wheel lock guns), and beautiful examples of black and white and other armour. Interspersed throughout the firearms, their accessories, and armour are fine examples of rapiers and smallswords. The Wallace Collection, like many quality museums, does more than simply display its fine collection. They run educational programs for all ages and offer periodic lectures focusing on particular items in the Collection. During my visit, one of the museum's staff members was giving an engaging talk on an embossed steel shield. Several rooms in the lower level of the museum are dedicated to education; during my visit another of their staff members was lecturing to a room of children next door to a room that allows visitors to try on replica armour and heft replica weapons. More information on The Wallace Collection can be found on their Web site, of course. Of additional interest are the published catalogues of the collection. The oldest, yet the cheapest and most widely available, is a catalogue by Sir Guy Francis Laking, first published in 1900. A reprinting of the 1910 Fourth Edition can be had for $20-$25 US. While its catalogue numbers are out of date, it is organized by room/gallery and display case and could be used for self-guided tours. A newer version, by Sir James G. Mann, was published in 1962 and is more extensive but much more rare and expensive. Copies of the Mann catalogues are made available throughout the arms and armour galleries of The Wallace Collection, allowing visitors to look up information on items they are viewing. 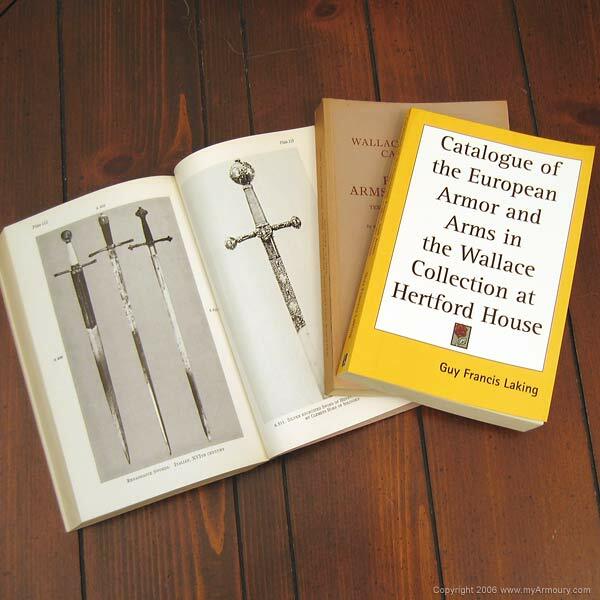 Due to the number of fine surviving examples contained in the collection, more information on individual items can be found in a myriad of published works on arms and armour. This is one of the pre-eminent collections of arms and armour in Europe, and a chance to view it in person should not be passed up lightly. It is easy to get to using London's easy-to-navigate subway and train system and is well worth spending time there. The lack of an entry fee lets the visitor decide how much the visit is worth, though you should keep in mind that donations help The Wallace Collection maintain its fine artifacts for future visits and future generations. Though items in this collection are widely published and widely replicated, viewing the pieces in all three dimensions offers perspectives that books simply can not. Visiting The Wallace Collection was a fantastic experience, and one I highly recommend to serious students of arms and armour.